Why Do Both of My Legs Hurt? Don’t ignore the pain in your legs, it could be a ticking time-bomb! Leg pain is often an indication that a grave health issue is developing. When you have pain in your legs while resting or lying down for no apparent reason, this may be an indication that something is wrong in the nervous or vascular system. Sudden, severe, or persistent pain such as this should be evaluated by your physician before it evolves into a full-blown emergency or worse. yourfootpalace.com gathered information about leg pain, its causes, threats, and treatments, then answers several frequently asked questions. • Regularly waking up in the middle of the night with leg or foot cramps. • Numbness or muscle pain in your legs in the morning. • Discomfort or pain in your legs after sitting for a while. • Rapid loss of leg muscle definition accompanied by pain and/or discomfort. • Spontaneous bruising on the legs and/or feet. • Frequent or lasting numbness of any portion of the legs or feet, and especially the toes. Any of these symptoms appearing spontaneously and for no apparent reason are cause for great concern. • Natural wear and tear. • Injuries to bones or joints. • Injuries to tendons, ligaments, muscles, or soft tissue. • Overuse (prolonged strenuous activities). • Problems in the lower spine. • Use of tight or heavy belts. Sciatica is shooting pain that runs from the lower back, through the buttocks, and down the back of the leg. Pressure on the sciatic nerve is one probable cause and is commonly seen in men who carry large wallets in their back pocket. The pain will often subside by relieving the pressure on the nerve. • DVT or Deep Vein Thrombosis (blood clots forming in veins deep within the body and not always accompanied by symptoms). Both PAD and CAD can be caused by atherosclerosis. 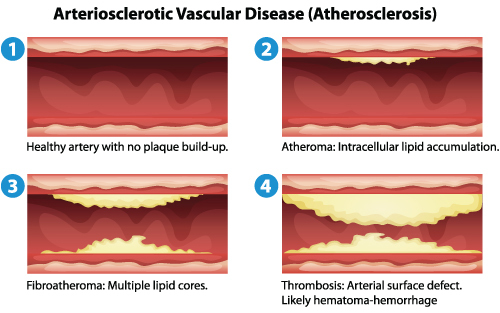 Atherosclerosis is an accumulation of cholesterol plaque along the walls of arteries. This accumulation causes the obstruction of normal blood flow, and when these plaques rupture, they can cause an acute blockage of the artery. When pain and discomfort in either or both legs are caused by varicose veins, DVT, PAD, CAD, or a combination of them, immediate medical treatment should be sought. What Can Leg Pain Lead to? • Blood clots traveling to the lungs. • Stress on the heart. While the majority of leg pain experiences are passing in nature, they should never be ignored. • Avoid wearing constrictive clothing. When the pain is sudden, severe, or persistent, seek immediate medical attention. Ignoring this type of leg pain may lead to serious health consequences. Question: Is leg pain a sign of cancer? Answer: Possibly. If bone cancer is the cause, the pain may cause a dull or deep ache in a bone region like the pelvis, ribs, arms, and legs. In this scenario, weight loss and fatigue will often accompany the pain. Question: Can a person die from peripheral artery disease? Answer: Yes. PAD can cause kidney failure, lead to foot or leg amputation, and because of atherosclerosis, many people suffering from PAD will die from a heart attack, sudden cardiac arrest, or stroke. As PAD often shows no symptoms, mature adults should be tested during regular medical checkups. Question: Can a vitamin deficiency cause leg pain? Answer: Yes. Some symptoms of a vitamin D deficiency may include fatigue and muscle aches or weakness. Question: Does magnesium help aching legs? Answer: Potentially. Another common cause of leg cramps and pain is magnesium deficiency. A primary symptom of a magnesium deficiency in the body is cramps, spasms, pain, and aches in the legs and feet. Seek medical advice before adding or removing dietary supplements from your diet. Question: What is restless leg syndrome (RLS)? Answer: Restless leg syndrome or RLS is a condition which causes an uncontrollable urge to move your legs when resting. RLS can be treated by medication prescribed by your primary care physician. Frequent or severe leg pain when resting may be an indication of a severe internal medical condition and should not be neglected. In this article, you discovered what causes leg pain, the threats it may represent, some treatments for it, and answers to frequently asked questions. Ignoring the sudden, sharp, or persistent pain you feel in your legs may lead to serious medical issues including chronic fatigue, amputation, stroke, or death. This type of pain should be addressed immediately, as part of successful treatment depends on early detection.